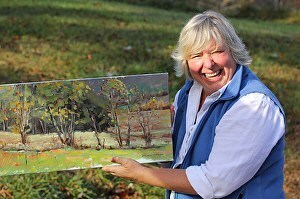 Beautiful, fun oil painting created in Bath County Virginia. This painting is avalible framed. Landscape painting feels like a new-found love, but it’s actually an old love, rediscovered. Now I am expressing what has influenced my creativity for an entire lifetime… childhood memories of having both my father and grandfather in the building trade, an ever-present attraction to things of God, and a high school art teacher that showed me I had a love and an ability to create beauty. Beauty and creativity connect me with God. When I am building oils onto a canvas, something is happening within me that cannot be explained with the word connection. With Him I begin to paint from my gut, even from my toenails! And it draws me even nearer to His people… which then takes me back to the dwellings, homes and landscapes that I paint. I think: Who lived in them? What was their life like? Did they recognize the beauty of their surroundings like I do? Kathie has received so much attention in the past few years it would be almost impossible to list all of her artistic accomplishments here. Bur in addition to her gaining recognition on the national stage, she is receiving notice locally too. Here is a blog written about her painting in the Washington & Lee University Literary Magazine, Shenandoah. Join to receive our newsletter, updates and special offers - we NEVER share your information.